Google had earlier advised websites to move to the secured HTTPS as its search engine would be pushing more results from secured pages at the detriment of non-secured ones. This has pushed many sites to install SSL (security) certificates on their sites. HTTPS provides a sense of security for users and protects users’ data by encrypting them from the server end. However, for Blogger and Blogspot based sites, the server end is a no-go area and totally controlled by Google, therefore, while WordPress users can easily contact their host to install SSL certificates on their root domain on the server end, there is no one at Google hosted sites to do same for Blogger blogs especially the ones with custom domains eg http://yourblog.com. Forcing https on custom domain name on Blogger with a trick might result in a consistent redirect loop on your blog url. Howtoshout article on how to enable HTTPS on custom domain listed two main disadvantages of enabling https certificate on Blogger Blog with custom domain, one of which is that it is almost irreversible, if you lose traffic and you want to go back to http, Google might remove your blog totally from index. 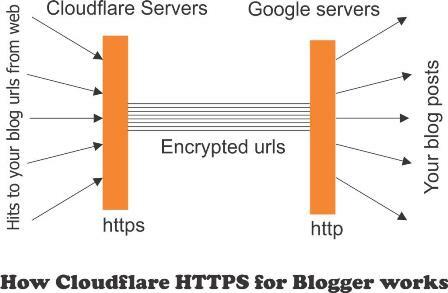 But, if you must use the Cloudflare HTTPS, use it ONLY on a new blog as old blogs with lots of unencrypted image urls will always display mixed content which defeats the main purpose enabling SSL certificates. Only Google hosted sites without a custom name can have the full encrypted HTTPS on the domain, eg https://yourblog.blogspot.com. 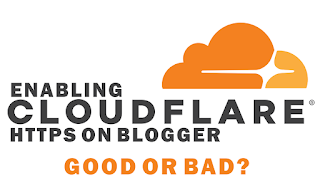 To solve this issue, Cloudflare provided a service to enable Google hosted blogs attach HTTPS to their domain names. They install their nameserver (with your permission of course) and acts as a filter between your blog and your traffic. 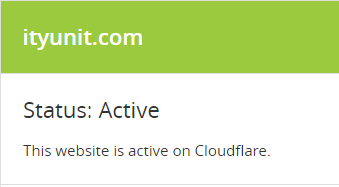 Cloudflare keeps your unsecured url behind its nest while, redirecting all hits on your blog through their secure servers. When a visitor click on your blog https url, he lands through the encrypted link on their servers to your blog on Blogspot. Therefore, while your visitor is protected in the world wide web, your site’s connection to Google servers is still unsecure. 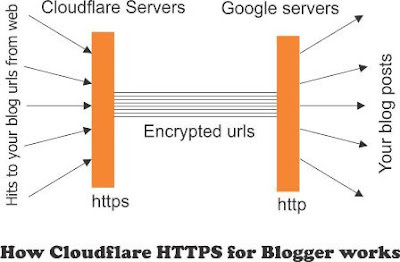 Since Cloudflare needs to route your traffic through its servers, it intercepts all hits from all versions of your blog url and redirect them to the secured url. Example, if a visitor land on a non www version of your url, this is the route it would take http://yourblog.com > http://www.yourblog.com > https://yourblog.com and finally to https://www.yourblog.com. Bots from most Search Engines including Google, Bing, Yandex etc may, in the long run, flag down such multiple redirects as spam. For a PR site on low budget hosted on Blogger, the green https on the url address bar is just good for business but for an information site that rely on Google SERP for hits, your SEO will be badly affected. Everyone wants a fast loading page, the additional redirect code on the blog’s xml file means more time for the various servers to understand and reroute all traffics. This affects your loadspeed significantly and consequently, your ranking on Search Engines Result Page (SERP) will also be impacted negatively. 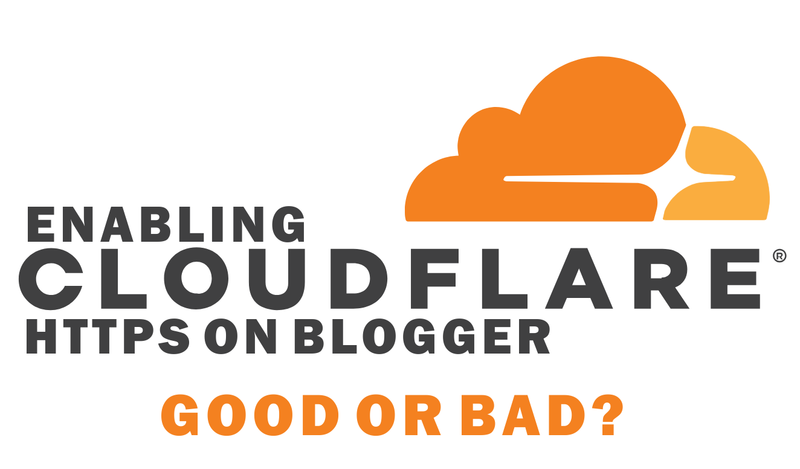 So what’s good about Cloudflare? When you register on Cloudflare and add their nameservers to your domain name, your blog benefits from Content Delivery Network (CDN). While ityunit.com (hosted on Google servers) may not go for the redirected https, it is still using Cloudflare services to provide security against spam bot hits and access from suspicious, dangerous or flagged IPs. Cloudflare helps manage your blog by caching your content for faster access by visitors. This boosts the loadspeed of your blog significantly. The earlier point about added load time is ONLY when you install the redirect codes, but without the redirect code, Cloudflare, in fact, accelerates your blog load speed via CDN. So, how do I get a good SSL on my blog? Although SSL certificate is a must ONLY for financial sites and other sites that handles private data, most information or knowledge-based sites are not really affected SEO-wise, by not having HTTPS on their url. However, be prepared for the future and what Google’s next algorithm may look like. To get your blog (with custom doman) fully secured on the server end, the best option is to migrate to WordPress. Most hosting companies do provide free SSL certificates and installation alongside the hosting plan although you may have to pay for a higher security level. I checked your url across some SEO test tool and the result was not really good but if you say traffic is up, then good cos that's all what we want. Also, you blog is a fairly new blog and as I said, "if you must switch, do it on a new blog"
Now official HTTPS is on the board. Free SSL (official HTTPS) is now the best option. No redirection and more secured because it is all happening on Google servers not a third-party server.